The Kremlin and Red Square, Moscow are associated with all major events in Russian history, and its monuments are great examples of Russian architecture. Both the Red Square and the seat of government Kremlin are located at the heart of Moscow. The city of Moscow was founded in 1156 as a seat for the czars. The current Kremlin dates from the 19th century. It consists of several buildings: churches, palaces and places in political use. A red brick wall surrounds the complex. The only sculptured monument on the square is a bronze statue of Kuzma Minin and Dmitry Pozharsky, who helped to clear Moscow from the Polish invaders in 1612. 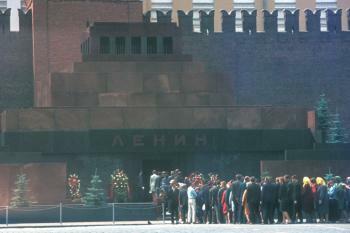 A visit to the Lenin-mausoleum here is of course a must. Procedures for visitors to the body / mummy are strict: lots of security at the entrance, no talking inside or standing still to take a closer look. Moscow nowadays probably looks much different from when I was there, in the Gorbatshov-era. It still was quite communist then (boring, strict, cold). Everything looked the same. One evening, I roamed the streets for hours (after several trips with the subway), looking for my hotel that seemed to be 100% identical to all the other buildings. Having arrived in Moscow in the evening, we decided to take a stroll through the city along the Kotelnicheskaya Embankment. During the walk, we were made to feel tiny and insignificant as we walked past the colossal monoliths of the Stalinist skyscrapers. But the feeling of insignificance was replaced with awe as we approached the lit-up walls of Kremlin. The combination of the expansive space of the Red Square and the playfully colourful cupolas of Saint Basil's Cathedral was absolutely mesmerizing. Of course, we came back the following morning, and saw the square in its entire glory, however, that first impression of the complex was simply unforgettable. Many medieval Russian towns had Kremlins of their own, serving the dual function of a fortress and a residence for the local prince. However, Moscow's Kremlin is special because of its complicated history stretching for centuries, history that is still evident throughout the complex. Hidden in the shadow of the Kremlin walls, Lenin's mausoleum containing the waxy mummy of the Bolshevik leader provides the everyday reminder of the country's tumultuous past. The Red Square and the outside of Kremlin and St. Basil's can be viewed without any fee, but to enter beyong the walls of the complex, you will have to part with 500 rubles. The entrance fee allows you to visit several cathedrals and the gardens inside Kremlin. After the visit, you are likely to feel that the outside of the complex is more impressive than the inside part. Unless you are an ardent enthusiast for Russian iconography and church architecture, you can probably save your money. 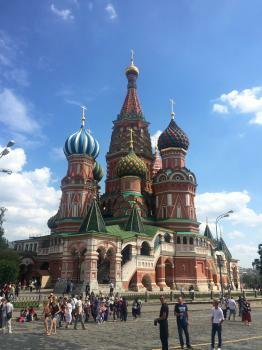 A visit to Moscow's Kremlin and Red Square provides great insight into Russia's past and present. The red brick walls of the Kremlin are familiar worldwide, housing not just the ghosts of the Cold War, but relics of Russia's rich tsarist history. 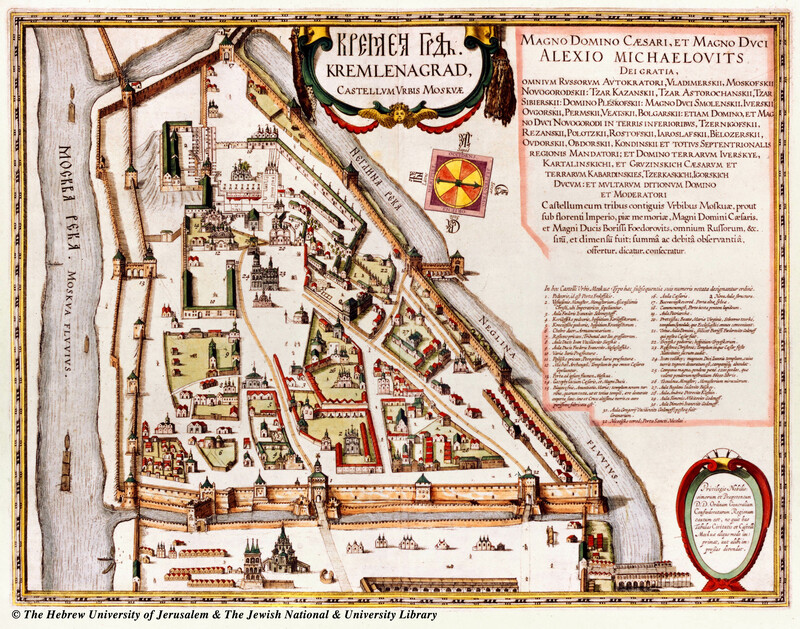 The Kremlin walls were constructed in the 15th century, and within the walls are many churches, including the Cathedral of the Dormition, or Assumption Cathedral. This cathedral was used for the coronation of Russia's tsars from Ivan the Terrible in 1721 all the way to Nicholas II, the last tsar, in 1896. Nearby in the Kremlin's armoury are crowns and thrones of Russian tsars, while evidence of some of the ruler's desires for greatness can be seen on the Kremlin grounds, including the world's largest bell and the immense Tsar's cannon. Outside the Kremlin walls is the famed Red Square, now used for events such as New Year's celebrations and military parades on Victory Day. Russia's most recognized building, St. Basil's Cathedral, topped with colorful onion domes, can be found at the southern end of Red Square, and is as brilliant to see as expected. 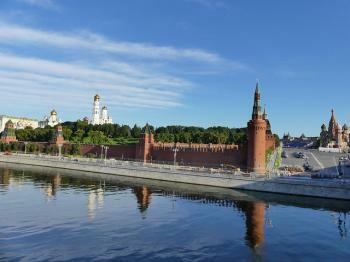 Moscow's Kremlin and Red Square are a must for anyone with an interest in Russian history. Logistics: Moscow's Kremlin and Red Square are accessible by public transportation, including the Metro stations of Okhotny Riad, Teatralnaya, and Ploschad Revolyutsii. In May I was able to get into the State Kremlin Palace and Faceted Hall. This is kind of special "secret" excursion, which is not ordinary access to the Cathedrals inside the Kremlin sold publicly. This excursion is offered by some agencies on selected dates (usualy several times per month), when the Kremlin is not occupied by various events. The maximum amount of people is 20 in the group with obligatory guide, it is necessary to provide passport details in advance (the foreigners are allowed), the price is 5,000 Rubles during weekends (80 euro), but it depends on the agency. I booked about 2 months in advance in order to get in on weekend day. Excursion lasts for 80 minutes and provides access into the Faceted Hall; 4 main ceremonial halls in the State Kremlin Palace (including that one where inauguration or official awarding takes place); medieval Terem's Hall enclosed by the present Palace and Empress's Chambers. Foto is only allowed in some places as indicated by the guide. In overall despite extremely expensive price this is the only opportunity to see probably the most important building in Russia. All the halls were lavishly re-created and reconstructed in the 90s in accordance with original decor from the 19th century (even imperatorial thrones were put back; they are modestly covered by partitions during present date Putin's led events). Medieval parts have rich frescos and are also quite interesting and original. In overall I liked the excursion, but unfortunately it's very expensive and not easy to get into without advance planning. I visited this WHS in August 2016. This WHS is Russia's most iconic and well-known site and clearly a top cultural WHS. Even though it is yet another church/cathedral, St Basil's is definitely a highlight of the Red Square at any time of the day. The interior is worth visiting (closed on Wednesdays) even though its colourful exterior is what makes it so famous. I visited the Red Square every day for 5 days and I loved walking round the Kremlin walls and towers at sunrise or at night and always felt very safe. The Lenin Mausoleum is only open from 10am till 1pm (closed on Mondays and Fridays) and if you have time it's worth visiting if only to get a closer look at Gagarin's tombstone situated just behind the mausoleum. The GUM superstore is completely lit up at night with thousands of light bulbs which in my opinion spoils the mystic atmosphere of the dreamy lights on the Kremlin wall. To my surprise the Red Square is fenced off at midnight and is accessible again after 7am. 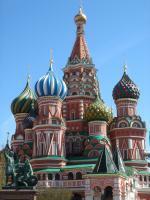 However, St Basil's can still be viewed at these times by going round the GUM superstore. Two other interesting structures are the dark red State History Museum and the Kazan Cathedral (even though both interiors are nothing special). By heading out of the Red Square towards the Four Seasons Hotel (excellent panoramic view from the Skybar) and the Alexander Gardens, you will find the Kremlin's entrance and ticket counters. 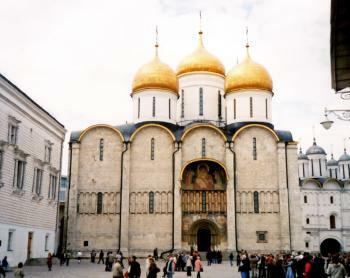 The basic entrance ticket grants access to the churches on Cathedral Square, while there are separate tickets to the Armoury Chamber, the Grand Kremlin Palace (through very expensive tours only) and the Ivan the Great Bell Tower (limited tickets; even though currently the panoramic view is spoilt by scaffolding on the Assumption Cathedral right opposite the bell tower). Allow at least half a day to be able to visit the main churches of Cathedral Square, namely the Assumption Cathedral, the Church of Laying Our Lady's Holy Robe, the Archangel's Cathedral, the Annunciation Cathedral, the Patriarch's Palace and the 12 Apostles' Church plus viewing the Tsar Bell and Cannon. I entered the Kremlin early in the morning before most of the tour groups and I managed to visit without too many crowds. The icons, mural paintings and church riches are mindboggling and would be worthy of inscription alone. That is why in my opinion this ensemble is truly one of the best WHS of the list. I wouldn't mind paying the entrance ticket again should I ever revisit as I really enjoyed my first visit. The center of Moscow and the symbolic landmark of Russia, Kremlin and Red Square are truly the magnificent places with unbelievable beauty and clearly one of the must see World Heritage Sites for every travelers. During my five days visit to Moscow, I went to the Red Square three times to admire the grandness of this place. I still remembered the first time I saw the square via the Resurrection Gate with the image of Saint Basil Cathedral in the far distance at twilight; I was stunned with this breathtaking view. The almost desert square with dreamy lights of surrounding buildings was just fantastic and became my highlight of Russian trip. The Moscow Kremlin is equally impressive with the square. 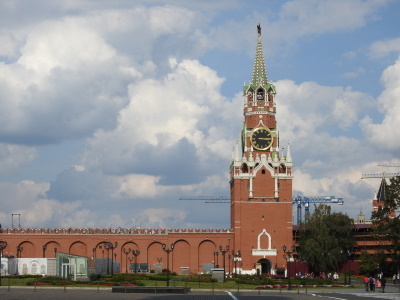 The whole complex is surrounded by the red high wall with many fortress-like towers; one of my favorite is the Spasskaya tower with its fanciful spire and large clock. Inside the Kremlin at first I was quite frustrated with many restrict areas and rule of no photograph near administrative buildings. The first building I saw was the Armory; inside was the large exhibition of Russian Imperial treasure with many gold and jewel objects, the highlights for me were many beautiful state coaches and royal robes. Then I saw the Cathedral of the Annunciation, its many golden onion domes was very beautiful; however, the Cathedral of the Archangel and the Assumption Cathedral were closed during my visit so I did not have a chance to see its famous fresco. After that I went to see the famous Ivan the Great bell tower, the tower was quite nice and lovely, also I had photo shot with the big Tsar Canon and Tsar Bell, two gigantic curiosities of Kremlin. Then I went window browsing inside the GUM department, I was shocked to see its beautiful warm lights interior with hundred of international brand names and thousands of rich Russian shoppers, I even imagined that this place can be Milan not Moscow. Next day, it was the time for Saint Basil Cathedral; its colorful candy-like domes were so perfect to be real. After back to my country I was quite surprised that I forgot to see the Lenin Tomb, actually during my visit I did not see the tomb or any long queue at all as there was a very large stage for some celebration in front of the tomb! Seem that the organizer did not care at all for the tomb existence, a great surprising act in the former center of Communist World. I visited red square, gum, lenin musoleum, kremlin about last year. It seems like yesterday for me. I like this place, no wonder if UNESCO listed it to be world heritage list. There is one place where i was impressed more, it is tsaritsino. This was a palace where Queen Ekaterina lived. It's a one of beautiful place with nice views surround it. I will come again to visit next time when opportunity comes. Many wonderful, beautiful places and buildings in Moscow. i was at kremlin red square at 10 th august 2009 , this time here atmosphere excellant like spring season, i like this place because of found something different here , this place took me the time soviet icon. i had made some memorable snaps infront of church & presidential palace. i had moved around a big mall infront of palace.i was there with my company business trip. i was visited there with one of my russian galfriend. really i had enjoyed alot that was my unforgetable memory for me. I went here in 1990, when it was still "the Soviet Union." To see the intricate details of St. Basil's Cathedral is quite special. I remember visiting Lenin's tomb and the long line to get in. I also celebrated the 4th of July in Moscow that year with other Americans in our hotel. Some of the most memorable points of my stay were going to the Moscow Circus and visiting an elementary school. It is a surprise to discover both that, as of Jan 2006, no one has reviewed this site and that, despite being one of the unarguably great “iconic” sites of the world, it was not inscribed (as the first “Soviet WHS”) until as late as Dec 1990. The UNESCO inscription takes great trouble to explain that inclusion of a site is not permitted until the sovereign state, on whose territory it is, has ratified the convention and submitted an official application. This the Soviet ambassador to UNESCO did on 24/10/1989 (The USSR having ratified the convention on 12/10/1988). A few days after the submission the Berlin Wall came down – by the time UNESCO were inscribing the site at Banff in Dec 1990 the USSR had just 8 months left. I would like to concentrate my review on just a part of the site - on what the UNESCO evaluation calls “the Soviet Union’s prime example of symbolic monumental architecture” – Lenin’s Tomb (photo)!! Whether it has “outstanding universal value” we won’t debate here! I visited it on several occasions during the Soviet period – there was always an enormous queue into which western tourists were inserted a respectful way back but not so far as to disrupt the Intourist arrangements for our other sightseeing! I often wondered what the Soviet citizens made of our queue jumping. How many were there out of genuine respect for the “great man”, how many to “demonstrate” their “loyalty” to the cause and how many as part of the necessary “cost” to be paid for getting a trip to Moscow with their work unit or other organisation. Despite plans to remove it going back to early post Soviet days (you can vote for or against at the Mausoleum web site http://www.aha.ru/~mausoleu/index_e.htm !!!) it is still open to visitors, though the “honour guard”, whose arrival at the doorway was so perfectly timed to synchronise with the chiming of the Kremlin bell (or did they hold back the chime if necessary! ), was removed in 1993. “Unfortunately” another wonderful building on Red Square which supported “Lenin mania” namely the Lenin Museum (the building from behind which all those ICBMs used to speed onto Red Square during the Mayday parade) was closed in 1992. It has just been reopened I understand to show Contemporary Art – together apparently, with some Lenin memorabilia. Who knows how long Lenin himself will survive in his mausoleum - so go there whilst you can! As one of my many travel lists I “collect” visits to the mausolea and graves of dictators. Lenin is one of the “Communist quadrumvirate” with Mao Tse Tung, Ho Chi Minh and Kim Il Song who all lie embalmed in open coffins. But there are many others “worth” visiting - Napoleon, Causcescu and Franco to name but a few) – they always provide food for thought on the corruption of power, the inhumanity of man to man, the impermanence of human endeavour and on mankind's yearning for strong leaders despite so much bad experience! Gold Surfaces: Assumption Cathedral. Dome and cupolas. Zero Mile or Kilometer Markers: A marker exists at ground level just in front of the Iberian (or "Resurrection") gate and chapel linking the north end of Red Square with Manege Square. Diplomatic Missions of Joseon Envoy Min Yonghwan: 21 May 1896 (Lunar date: 9/4. Russian date: 9/5) Clear weather. "The streets and roads of this capital city are not so clean and beautiful, but they say that all the people of this country regard the old capital as important because all important ceremonies are performed here." 26 May 1896 (Lunar date: 14/4. Russian date: 14/5) Clear weather. "All the envoys gathered together, and then we entered the Kremlin Palace. 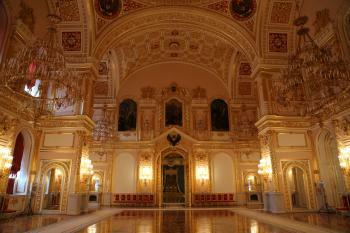 The Russian style of coronation ceremony takes place in a cathedral. If you do not remove your hat, however, you are not allowed to enter the cathedral. The envoys of our country, China, Turkey, and Persia are not permitted to remove our hats, and so we could not enter. Therefore, we watched as before from a balcony outside the cathedral. The cathedral is not far from the palace grounds." Re-routed rivers: the Western walls of the Kremlin were defined by the River Neglinnaya "The Kremlin was built on a hill west of the Neglinnaya, using the river as a moat" (Wiki) and "At one time the River Neglinnaya, a tributary of the Moskva, flowed along here protecting the Kremlin walls. There were two bridges over the Neglinnaya, a drawbridge by the Pine-Grove Tower and a stone arched bridge linking the Trinity and Kutafia towers". Che Guevara: "Walking through Red Square in Moscow, November 1964." Naser ed-Din Shah: "we reached the gate of the citadel-palace of the Kremlin, which is one of the grand palaces of Russia—nay, of all the Franks"
Tintin: "Les aventures de Tintin, reporter du "Petit Vingtième", au pays des Soviets" Cover shows Tintin next to St Basils Cathedral. 301 Community Members have visited.